Parameters input to the Monte Carlo computer model of ERC accumulation during yeast aging are shown. "WT" parameters were calculated using the predicted level of circles in old clels (Ref. 60) for Emax, assuming a low probability of segregation of ERCs to daughter cells and adjusting Pcir (probability of ERC formation) and Prep (replication efficiency of ERCs) to fit a median life span of 23 and a maximum life span of 40. A (—) for an input parameters signifies that this parameter was the same as that used in "WT." SGS1 value for Pmmis that estimated in McVey et al. (91); a three-fold increase in Pclr was estimated from the aproxímate three-fold increase in the rate of marker loss in the rDNA in sgs1 mutants (Ref. 89). Figure 5 Monte Carlo model of ERC accumulation during yeast aging. The graph shows the predicted survival curve, as would be calculated by a yeast life span analysis, and the predicted number of ERCs/cell, as a function of generation. This corresponds to the level of ERCs that would be detected on a Southern blot of yeast cells sorted to the indicated generation. Values of the parameters of the model used are given in Table 1. 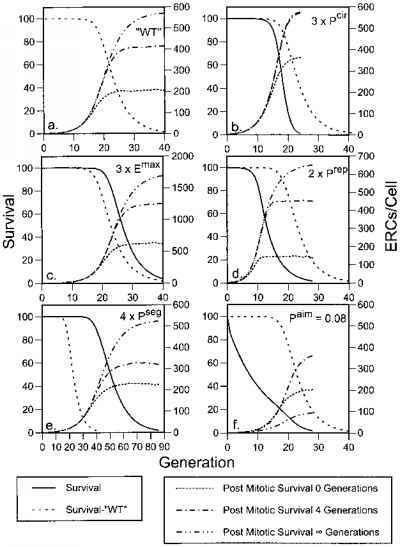 ERCs/cell are given for postmi-totic survivals of 0, 4 and infinite generations, as the levels of ERCs that are measured are dependent on this parameter. The dashed "wild-type" survival curve is reproduced in all panels for comparison. (a) Wild-type yeast life span; (b-f) parameters were kept the same as those used for wild-type life span except a single parameter that was altered as indicated in Table 1. Table 1, row e; Fig. 5e). The level of ERCs in an unsorted population of yeast is most reflective of the levels in young cells, and decreasing the asymmetry of ERC segregation provides a means of transferring ERCs into young cells. Increasing the age-independent mortality rate (discussed regarding sgs1 mutations above) will cause a decreased life span and modestly decreased levels of ERCs (see Table 1, row f; Fig. 5f). The simple interpretation of an ERC model of yeast aging that higher levels of ERCs observed in an unsorted population imply a shorter life span and lower levels imply a shorter life span is not correct. This issue may be pertinent to the case of petite yeast (83). Petite yeast, which are deficient for aerobic respiration due to deletions within the mitochon-drial genomes, are long lived in some strain backgrounds (94). It has also been reported that petite yeast also have increased levels of ERCs in non-age sorted populations (95). Whether there is an increase in ERCs specific petite strains in which the life span has been analyzed has not been reported. It will be informative to analyze those factors in petite yeast that do not show an inverse correlation between the life span and the ERC level. 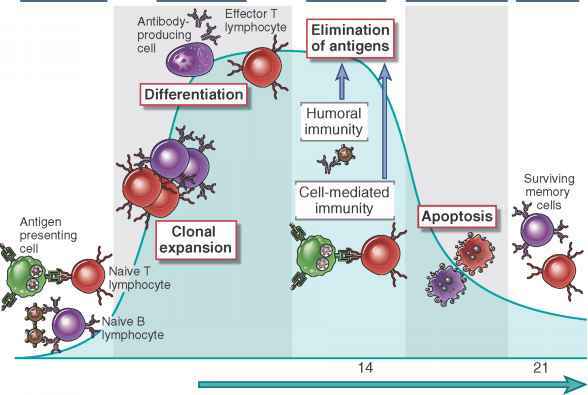 Segregation of marked episomes can be analyzed (96), changes in the terminal arrest phenotype can be quantitated as a function of age as a potential measure of changes in age-independent mortality rates (91), and Emax can be crudely tested through the experimental introduction of an ERC using the Cre-fox system (60). No increase in ERC levels in sgs1 mutants has been found (89,90). The predicted increase in ERC levels in the sgs1 mutant compared with isogenic SGS1 wild type, taking into account changes in the rates of ERC accumulation and the increase in age-independent mortality (91) can be calculated (see Table 1). A 2.3fold increase in ERCs is predicted in an unsorted population and between 1.7- and 2.7-fold increase in levels is predicted in comparing seven-generation sorted populations. Published reports at the time of his writing have not demonstrated sufficient sensitivity—given the complexity in quantitation of ERC levels—to rule out differences this small.